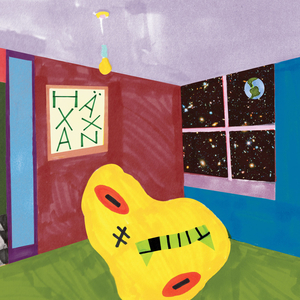 "The Magnificent Planet of Alien Vampiro II" is the sophomore full-length Tel Aviv's psychedelic stalwart yout' HÄXXAN (pronounced 'chasan'). This is riff heavy and overdriven power trio madness that brings the rock hard, laced on occasion with subtle sound effect trickery and soaked with only the juiciest hooks. "Silkworms" doubles as an earworm, and on "Hunter," HÄXXAN shifts effortlessly from humorous heartbroken school boy chant to crashing walls of distortion that would give Ty Segall / Fuzz a run for the money. As a matter of fact, they've shared the stage on several occasions, and Ty himself has dug their ecstatic, high energy live show. These kids live for rock'n'roll, and have recently relocated to Berlin, where they can live independent & free, between the river & the sea.